Crazy Cows, one of the funniest video slots to be developed by PlayNGo, is based on the theme of hilariously funny cows. The slot is packed with lucrative features such as wild reels, re-spins, and free spins, along with a top jackpot of 2,500 coins. Crazy Cows is played just like any other slot. Players need to first place a bet and then hit the Spin button to set the reels spinning. They will get paid if a winning combination of icons appears on the reels. Crazy Cows, as its name suggests, is based on a funny animal theme. It tells the story of some funny cows, especially of a bull called Bill. The graphics are cartoonish and amusing, and as players spin the reels, they can hear Western music in the background. The game cannot fail to put a smile on players’ faces, especially as it comes with some huge wins. The reels feature icons of amusing cows, ears of corn, ducklings, and high-value card symbols. The Bull is the wild icon, and if it appears on the middle reel, it flexes its muscles and expands all over the reel, leading to some extraordinarily huge and exciting wins. The slot has a re-spins feature, which gets activated whenever the Bull appears on the middle reel and heart necklaces appear on the second and fourth reels. The wild reel will then freeze in position while the rest of the reels are re-spun five times. If players land heart necklaces on the second and fourth reels during a re-spin, they will get two more re-spins. This means, players can win up to seven re-spins with the wild reel frozen in position. If players land three Barn scatter icons on the first, third, and fifth reels, the High Dive Feature gets activated. Players will then have to select one of three cows. The selected cow then dives from the roof into the water trough. Depending on the cow’s performance, players will receive a cash prize and free spins. Initially, players will receive up to 15 free spins with doubled wins. However, if they land at least two Dog scatter symbols during a free game, their multiplier value will increase to up to x5. Players can also land Barn scatter symbols during the free spins to win up to 50 extra spins. 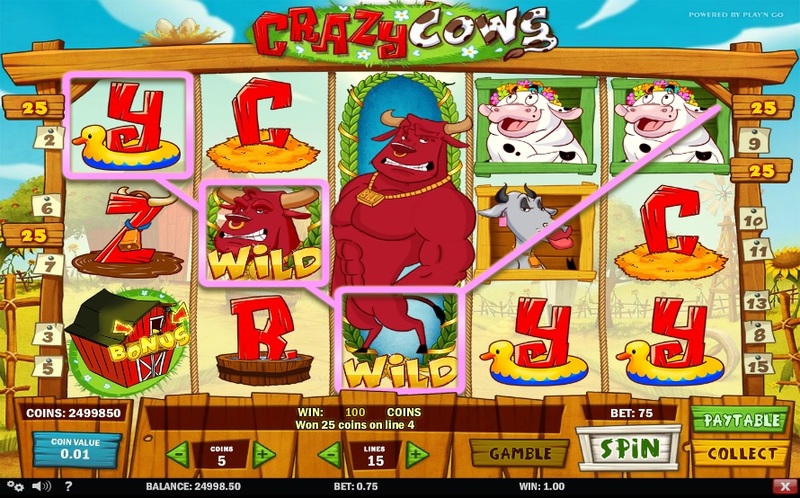 Crazy Cows is one of the most amusing slots to be released by PlayNGo. Anybody who loves farm life will be delighted with this slot, which depicts the best parts of living on a farm. Players can interact with a wide range of farm animals, not just cows, unlock incredible bonus features, and win hundreds of free games and multiplier values of up to x5.